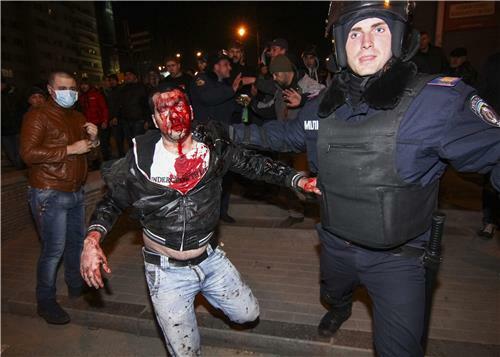 Some context on the Donetsk violence: there have been clashes between pro- and anti-Russia activists before. But never a death, as tonight. Injured guy from last photo not a protester. "I was just watching from McDonald's, and somebody attacked me." Ukraine's Prime Minister Arseniy Yatsenyuk confronted Russia in front of the U.N. Security Council on Thursday, accusing Moscow of "military aggression" that has "no reason and no grounds." But Yatsenyuk told the council he is convinced Russia does not want war, and he urged Russia's leaders to return to dialogue with Ukraine. 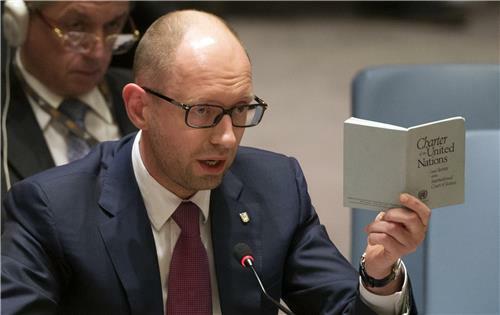 "If we start real talks with Russia, I believe we can be real partners," Yatsenyuk said. Thursday’s Security Council meeting in New York comes amid the continuing crisis in Ukraine’s Crimean Peninsula, which has a population comprised mostly of ethnic Russians and has long operated with a great deal of autonomy from the Ukrainian government in Kiev. Russian troops seized control of Crimea last month after massive protests in pro-Western parts of Ukraine forced out the country's pro-Moscow government. 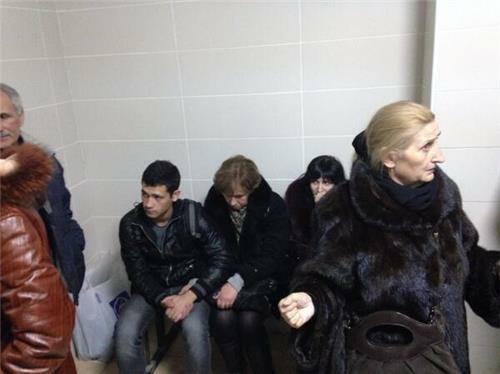 Crimeans will vote Sunday in a referendum to decide whether to secede from Ukraine and join Russia. The interim Ukrainian government has called the vote illegitimate and a direct violation of the country’s constitution. At the Security Council meeting on Thursday, Yatsenyuk also accused Russia of violating Article Two of the U.N. Charter, which states that member nations cannot use or threaten to use force against the "territorial integrity or political independence of any state." Al Jazeera's James Bays asks what the Ukrainian government in Kiev hopes to achieve by bringing the UN Security Council to a vote on the draft resolution presented earlier. 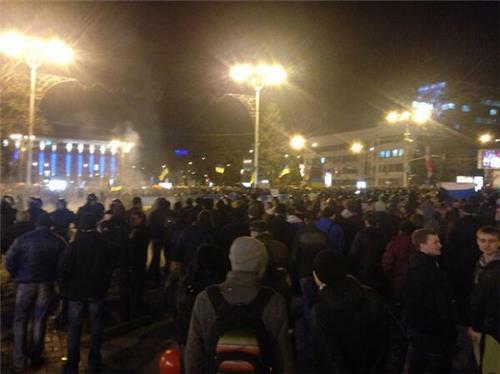 Yatsenyuk responds: "We want to stop Russian invasion. We want to get to negotiation table. We want to have Ukraine independent and free, with no Russian boots on the ground." Acting Ukrainian PM Yatsenyuk is now addressing the media following the conclusion of today's UN Security Council meeting. "My government is committed to all international obligations, and we adhere to all international responsibilities," says Yatsenyuk. "The UN Security Council is the primary body which is responsible for peace and stability in the world, to handle the situation and support Ukraine in tackling this crisis." "This isn't just a crisis in the relations between Ukraine and Russia," he adds. "Russia is violating the entire global security. It is violating the Budapest Memorandum." Acting Ukrainian PM Yatsenyuk reiterates that "Crimea was, is and will be" an integral part of Ukraine. "We will never recognize handmade, artificial, falsified referendums." "What we ask for...we ask for truce," says Yasenyuk. "History will judge us. And we will do whatever we can to preserve the peace and to save our country." Acting Ukrainian Prime Minister Arseniy Yatsenyuk is scheduled to address the UN Security Council at 3pm ET Thursday. We'll be carrying his comments live on Al Jazeera America. Watch live here. 'It's certainly not de-escalating, Carney said of the situation in Ukraine, adding that is why the United States is trying to persuade Russia to avail itself of diplomatic options. When asked about the arrest of Dmytro Firtash, Carney demurred telling reporters he would have to refer them to the Department of Justice. A downturn in U.S. stocks deepened Thursday afternoon as rhetoric between the U.S. and Russia over the conflict in Ukraine intensified. The decline put the Dow Jones industrial average on the path for its fourth loss in a row. Secretary of State John Kerry warned Thursday that Russia will face immediate, "very serious" steps from the United States and Europe if it annexes Ukraine's Crimea region. Kerry told a Senate committee that Moscow should expect that the U.S. and the European Union to take measures against it on Monday should it accept and act on the results of this weekend's referendum in Crimea. Crimeans are to vote on joining Russia on Sunday in a vote that the U.S. and the EU say violates Ukraine's charter and international law. "If there is no sign of any capacity to be able to move forward and resolve this issue, there will be a very serious series of steps on Monday in Europe and here with respect to the options that are available to us," Kerry warned. He told lawmakers the U.S. estimated there were currently about 20,000 Russian troops on the Crimea peninsula, below the 25,000 allowed under an agreement with Moscow on stationing its bases there. According to Interfax, senior Russian and NATO generals have discussed the situation in Ukraine by telephone, Reuters reports. While in Budapest, German Foreign Minister Steinmeier said he assumes the Crimea referendum will be followed by steps for the integration of Crimea into Russian territory, Reuters reports. The minister also reportedly said all attempts to de-escalate the situation in Crimea have been rejected by Russia, according to Reuters. Steinmeier said there will be a third stage of sanctions if Russia continues to refuse de-escalate the situation in Crimea, Reuters reports. Steinmeier went on to say European Union countries are slated to agree over the weekend on a list of Russians to be affected by visa bans and asset freezes, according to Reuters. Resolution on #Ukraine has to be "put in blue" for 24 hours. But could be vote Fri or Sat. Western nations hoping for 13 against one vote on #ukraine - with #China abstaining. Ukraine's acting president said on Thursday that Russian forces were concentrated on the border "ready to invade" but he believed international efforts could end Moscow's "aggression" and avert the risk of war. A statement on the presidential website said Oleksander Turchinov told a local television channel that, when Russian forces took over the southern region of Crimea last week, other units were concentrated on Ukraine's eastern border "ready for an invasion of the territory of Ukraine at any moment". "We are doing all we can to avoid war, whether in Crimea or in any other region of Ukraine," he said, adding that Ukraine's own armed forces were in a state of full combat readiness. However, he said: "All of civilized humanity supports our country. All the leading countries of the world are on the side of Ukraine, and I am sure that this united effort in the international arena, bringing together all democratic countries, can still allow us to halt this aggression." A U.S. Senate panel on Wednesday approved legislation that would impose strict sanctions on Russians involved in Moscow's intervention in Ukraine, provide aid to the new government in Kiev, and implement reforms of the International Monetary Fund. The Senate Foreign Relations Committee voted 14-3 for the measure, with several committee Republicans joining the Democratic majority in favor. The bill next goes to the full Senate for a vote. If it passes there, it would have to win approval in the House of Representatives to become law. The panel acted on the same day President Barack Obama met with Ukrainian Prime Minister Arseny Yatseniuk at the White House in a high-profile show of support. Obama warned Russia that the West would be forced to apply a cost to Moscow if it fails to change course in the dispute with Ukraine. Among other things, the legislation would impose sanctions on Russians and Ukrainians judged to be involved in violence or human rights violations during anti-government protests in Ukraine that began late last year, as well as against anyone involved in undermining Ukraine's security and stability. The legislation also directs U.S. authorities to help Ukraine's new government investigate acts of corruption and return assets to Kiev. It did not target Russian corporations or banks, as some lawmakers had suggested after Russian President Vladimir Putin sent troops into Ukraine's Crimea region. President Barack Obama, meeting with Ukraine’s prime minister on Wednesday, promised to defend Ukrainian sovereignty against incursions from Russia, as a Senate panel passed legislation to offer support to the nation in transition. Obama said after meeting interim Prime Minister Arseniy Yatsenyuk that he hoped U.S. diplomacy with Moscow over the next few days could cause a "rethinking" of plans for a secession referendum set for Sunday in Ukraine’s pro-Russia Crimea region. Obama said that Russia had infringed international law with its incursion into Ukraine, and he warned that if Russian President Vladimir Putin did not change course he would face "costs" from the U.S. and the international community, which has already threatened economic sanctions. 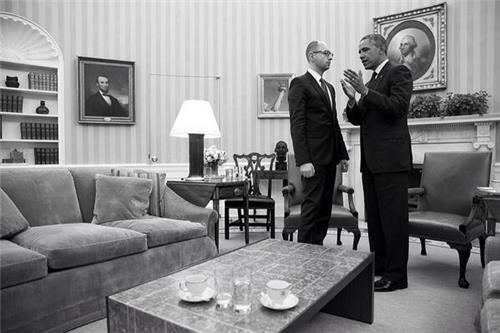 Obama told Yatsenyuk in the Oval Office – in a visit intended to confer symbolic legitimacy on the Kiev government – that he had been impressed by the courage of the people of Ukraine during the ouster last month of President Viktor Yanukovich and the political turmoil that followed. "We have been very clear that we consider the Russian incursion into Crimea ... to be a violation of international law," Obama said. "We have been very firm in saying that we will stand with Ukraine and the Ukrainian people in ensuring that territorial integrity and sovereignty is maintained," Obama said. Yatsenyuk told reporters in the Oval Office that Ukraine would "never surrender" in its fight for territorial integrity, but also that it wanted to be a good partner to Russia. Obama said that the United States would not recognize the results of the referendum in Crimea on joining Russia. Speaking on the upcoming — and quite controversial — vote in Crimea, President Obama said 'we completely reject' the plans for the Crimean referendum, Reuters reported after Obama's meeting with Yatsenyuk, adding that Obama said the vote has been put together in a 'slapdash' fashion. Russian President Vladimir Putin on Wednesday discussed the crisis in Ukraine with Swiss Foreign Minister Didier Burkhalter, whose country chairs the Organisation for Security and Cooperation in Europe (OSCE), the Kremlin said. Putin and Burkhalter "discussed the capabilities of the OSCE in the context of fostering a resolution of the crisis", the Kremlin statement said. It gave no details and said nothing about any agreement. An OSCE statement later said the men had "talked about possible ways to overcome the current crisis" and focused on "potential modalities" for the creation of an international contact group on Ukraine. Burkhalter also "stressed the importance of an early consensus" on the deployment of an OSCE monitoring mission to Ukraine, to contribute to an improved security situation, including for minorities, the OSCE statement said. Talk of a mediation role for the OSCE has come to little. Burkhalter said on Tuesday the group would not send a mission to monitor a referendum in Crimea on Sunday over whether the Ukrainian region should join Russia, warning the plebiscite would be illegal. The Senate Foreign Relations Committee met Wednesday to mark up the Support for the Sovereignty, Integrity, Democracy, and Economic Stability of Ukraine Act of 2014. Around 3:30 p.m. ET, Sen. Rand Paul's amendment was rejected by the committee. The committee then took up Sen. Barrasso's amendment, which didn't go far. The mark up session is ongoing. Following his meeting with Ukrainian Prime Minister Yatsenyuk, President Obama said the message to Russia is the West will be forced to apply a coast to Moscow if it doesn't change it's course, Reuters reports. Pres. Obama said 'we will stand with Ukraine' in efforts to maintain territorial integrity and sovereignty, according to Reuters. For his part, Yatsenyuk reportedly said 'we will never surrender' to Russia, and he stands ready for talks with Moscow. Yatsenyuk went on to say 'Ukraine is and will be part of the Western world,' according to The Associated Press.
.@SenRandPaul : $1 B loan guarantee for #Ukraine to pay its bills not a good way to send Putin a signal - it's a "gift to Russian creditors"
Indeed, on the pretext of humanitarian intervention to defend “oppressed” Russian-speakers in Crimea, Putin’s shadowy troops without insignia roam the region. They are blocking Ukrainian military installations, though there is no evidence of any abuse from the Ukrainians. This is the key to understanding the Russian mind: We are a hypothetical culture. Ruled by despots for most of our history, we are used to living in fiction rather than reality. The enduring myth of a caring and benevolent czar — be it Ivan the Terrible, Peter the Great or Joseph Stalin — who punishes his subjects for their own good and the good of the nation, helps explain the current Russian support for Putin and his actions in Ukraine. Putin’s approval rating now stands at almost 70 percent. To withstand constant oppression, the Russian people have learned to justify it. The easiest approach is to accept the Kremlin stance that the state, whether czarist or Soviet, always comes first. Individual hard work and international competition in gross domestic product numbers or quality of life are far less significant than the belief that the government is seeking to secure Russia as a glorious nation that is both feared and respected. Putin’s indiscriminate jailing of those who speak out against the Kremlin control, his clamping down on any remnants of free press in Russia and his promotion of a dictatorship of order over transparent laws are declared necessary given the grandiosity of his agenda. It is for Russia’s greater glory that many people seem ready to accept individual debasement. With us, progress is rarely considered a means of improving daily lives. It is more about helping the state prove itself superior to everyone else. Eight U.S. senators will travel to Ukraine on Thursday to meet with leaders of its interim government and other groups, Senate aides said on Wednesday, amid tensions over Russia's efforts to annex Ukraine's Crimean region. Arizona Republican Senator John McCain will lead the group, which includes his fellow Republican Senators John Barrasso of Wyoming, John Hoeven of North Dakota, Ron Johnson of Wisconsin and Jeff Flake of Arizona. Three Democratic senators are also going: Richard Durbin of Illinois, Christopher Murphy of Connecticut and Sheldon Whitehouse of Rhode Island. McCain and Murphy, who is chairman of the Senate's European subcommittee, traveled to Ukraine's capital, Kiev, in December and addressed anti-government demonstrators during protests that helped lead to the ouster of former President Viktor Yanukovich. According to ITAR-TASS, Russian President Putin has discussed the situation in Crimea with a Crimean Tatar leader, according to Reuters. Senators will call for blocking assets and revoking visas of officials responsible for disrupting Ukraine’s sovereignty and those who perpetrated “gross human rights abuses” against anti-government protesters in the eastern European country. The 10-page bill drafted by top senators from both parties, which has not been publicly released, was obtained by POLITICO on Wednesday morning. The Senate Foreign Relations Committee is set to mark up the legislation later Wednesday. The package combines assistance to Ukraine, as well as sanctions against officials responsible for the “violence or undermining the peace, security, stability, sovereignty, or territorial integrity of Ukraine,” according to the legislation. It also includes the changes to the International Monetary Fund called for by the Obama administration and Democrats – a move that is opposed by some congressional Republicans. The legislation is still in draft form and could be changed before the committee vote. It’s far more comprehensive than the legislation that cleared the House last week, which simply provided loan guarantees for Ukraine. According to the Kremlin, Russian President Putin and French President Hollande discussed the possibilities for stepping up international efforts to resolve the crisis in Ukraine, Reuters reports. According to a senior senator, a Senate panel's bill on Ukraine will contain IMF reforms and sanctions, Reuters reports.